I like a few quiet minutes to prepare for the day. Sitting outside and taking in the sunrise settles me. 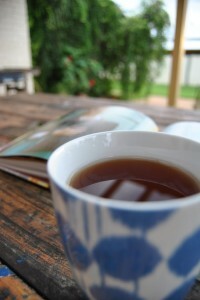 Doing a few jobs quietly, a cuppa, then listening to the Rural Report on ABC Radio. These are my rituals. Jumping up and racing around to get out the door does not settle me. Sometimes it happens or is necessary, but always it leaves me unprepared for my day. This morning I took in my new book. I love the ideas behind this. I’ll chat more about it later. Right now they’re reading the cattle prices and that means I need to cook breakfast.